I loved Shades of Magic, so I grabbed this as soon as I heard about it (I live under a rock, okay?). 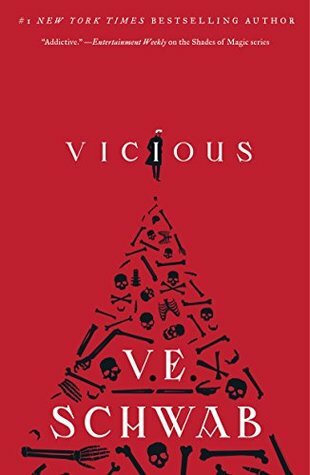 Vicious follows the intertwined story of Victor and Eli, two EOs (ExtraOrdinaries). Now, I’m not a big fan of the jumping-around-in-time-and-space format of this story. More than half of this book felt like backstory and exposition, just to get to the last fourth – when everything comes together. It was well-written backstory, but backstory nonetheless. The back-and-forth through time made the plot feel disjointed at times, and while I love the way the plot unfolded, a part of me wishes the plot had been more straightforward from the start. I love the characters – no one in this book is a good person, not the “classic hero” type. There’s no Superman in this book. While Victor is the main character, he’s by no means a good person or a hero. He is driven by revenge, and I love it. I like fantasy more than science fiction, which did deter me a bit from this book. I’m not a fan of the superhero theme, but I do like what Schwab has done with it. She’s taken it and turned it on its head. Overall, Vicious gets a 4 out of 5. I’ve already started reading book 2, Vengeful.